Internists are piecing together technology to improve their practice management, but too many pieces are more of a puzzle than a picture. All the new devices ultimately need to lead to better care, the experts urge. Dabigatran and rivaroxaban spare patients the need for regular blood checks, but warfarin is less expensive and has an antidote to reverse bleeding, if needed. Does the convenience of the new generation of drugs and the potential to increase compliance with therapy outweigh their downsides?. If your idea of a stimulating vacation involves unsafe destinations, bribing foreign officials for a medical license and practicing resource-limited hospitals, then there's an organization willing to set it all up for you. (You also get to meet kings and see beautiful scenery.). A 73-year-old man struggles with the decision whether to consider anticoagulation for atrial fibrillation, a “decisional conflict” that affects many trying to balance risks and rewards of medical treatments. Doctors should help the patients choose, but then abide by that decision. As ACP's outgoing president contemplates the upcoming change of leadership, she realizes that while the people may change, the organization still requires its leaders and its members to continue. Health care reform has made progress with internists already seeing bonus reimbursement in their offices. But the Affordable Care Act is about to run smack into the Supreme Court, and what happens there could result in any range of outcomes. Technological devices can make physicians lives easier, but integrating them can be difficult. 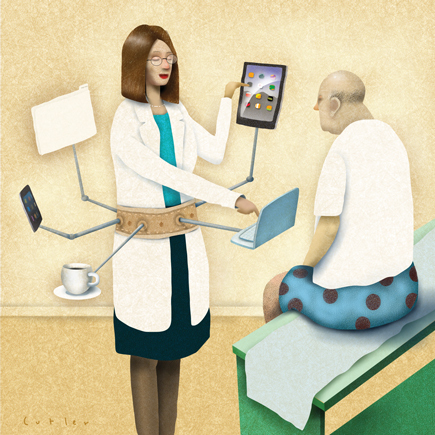 Physicians report on how they make the many mobile devices work in their offices. Readers submit their thoughts on using scribes and paying for medical school. The Centers for Medicare and Medicaid Services heard the primary care community's complaints and have delayed ICD-10 implementation until further notice. The agency did, however, launch several new tactics in order to collect overpayments. Once a practice receives pay-for-performance bonuses, how should they be distributed? Do they go to the treating physicians, the entire practice or some kind of hybrid? There options aplenty to consider. All members are encouraged to attend ACP's Annual Business Meeting to be held during Internal Medicine 2012. A 34-year-old woman is evaluated for sharp intermittent pleuritic chest pain that has persisted for 1 week. The pain is worse when she lies down in the supine position. She has had no fever, chills, cough, or weight loss. She had acute viral pericarditis 6 months ago that was treated initially with ibuprofen, but when she failed to respond after 3 days, a 10-day tapering dosage of prednisone was instituted, leading to resolution of clinical symptoms.